About 35 miles south of Eielson AFB off AK-2 (Richardson Hwy). Look for sign on southwest side of road. Water spigots available around campground for potable water. No dump available. Lodge with TV and games. 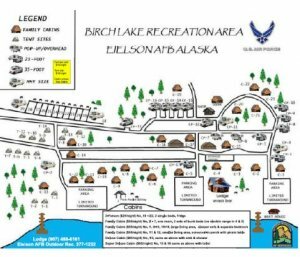 Eielson Outdoor Recreation hosts the Birch Lake military recreation site. 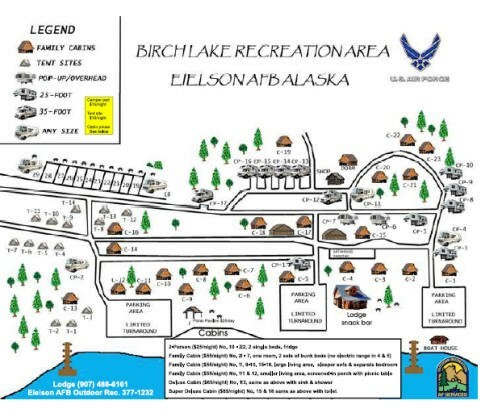 Birch Lake is an off-base recreational area located 35 miles south of Eielson on the Richardson Highway. Facilities include a lodge, cabins, camper pads, showers and a picnic area. There is a playground and sandy beach in the common area. A picnic pavilion with sand volleyball pit is available for reservation. Several types of boats are available for rent at the lake. This facility is in a great location for Anchorage. 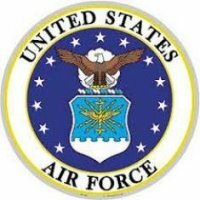 Ft Richardson is connected to Elememdorf AFB so access to both bases is excellent. The campground gets a little loud during the day since the location is very close to the runway but I like the sound of freedom. The men and women have only one shower and bathroom each but most sites have full hook-ups so we just used our own. The rates have been increased to $21 for full hook-ups but it is well worth it. You are permitted to eat at the galley for any meal and it is great. The camp hosts (Don & Linda) were filling in temporarily until the regular host made it in and they outstanding. They were always driving around checking on the campers which you do not find many places. We camped there in a motor home and would definitely go back again. On July 30 and August 1 we stayed at Birch Lake FAMCAMP. The camp is in a beautiful location and has lovely facilities. However daily management of this camp is lacking and not up to FAMCAMP standards we have encountered throughout the US. The staff and camp management seemed uninterested in serving customers. Every time we asked something there were no answers from the staff. Even the manager had no answers. All seemed more interested in playing games and music than helping customers. These were the defects: 1. Bathrooms are not swept at all. The mats were soiled and had a lot of dirt underneath, to say nothing of the mold growing. 2. The walls were filthy with shampoo and dirt. 2. Doors to bathrooms not only have kick-marks on the inside and outside but the locks on 4 of the baths were either missing or inoperable. 3. Two of the bathrooms had so much water on the floor that you could not get to the toilet without wading through the water. 4. Our site had at least 100 cigarette butts. There was no attempt to clean campsites on departure of guests. 5. When walking around the camp we noticed lots of minor repairs that could be done with a screwdriver, for example screen doors and knobs. For the days we were there nothing was done about these conditions. The only action was toilet paper delivered daily, but that is it for the cleaning effort. FAMCAMPs are a morale builder for returning troops and families. 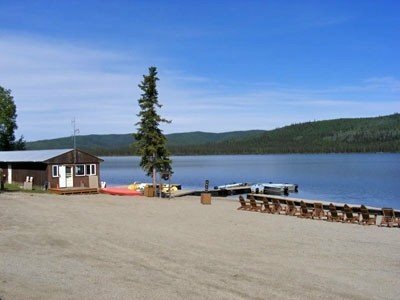 It is sad that beautiful camps such as Birch and Bear Lake camps are not managed to provide normal high standards of camp cleanliness. Overall a good park set among the pines and hills along Birch Lake. No true lakeside campsites but some with "lake view". Beware of sites 25 through 27 as they don't have gravel or a driveway...you either have to use your neighbors gravel drive to get in or out or go down a 3 foot drop to get to your site. A little tricky especially if you have a trailer with no clearance (like ours). For some reason the water was not turned on when we were there over the holiday weekend so no showers and no explanation when we asked. Also the staff is a bunch of highschool kids who were really no help at all, hence the low rating on hospitality. They were really only there to socialize with each other. They had a new playground, a beach, boat rentals and a lodge with dish tv and board games. Update...We visited again and this time rented a cabin for my inlaws to stay in. It was FILTHY. My mother-in-law had to clean it when we got there. It looked like it had not been cleaned all season. And this was a newer cabin. Also, promised a queen size bed and got a double. Save your money (they are not cheap) and DON'T rent a cabin. Apparently they are all like that. Also, restrooms are run down and old. Don't expect much there, either.